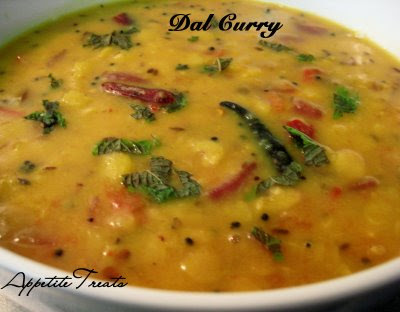 Wash the dal, bring 3 1/2 cups water to a boil. Add in the dal and simmer for about 15 minutes, until you can crush the dal with the back of a spoon. set aside. Heat oil in a skillet and add mustard seeds, sizzle for few seconds until all the seeds have popped. Add in the cumin seeds, onion and half the coriander leaves and fry until onion is golden. Add the tomato, turmeric, garlic and chili, mashing the tomato with the spices to make a paste. Add the dal with a little of its cooking water. Stir well and add salt to taste. Let it come to a boil. Garnish with corriander leaves and serve.